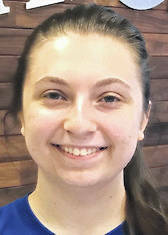 PIQUA — The Upper Valley Career Center has named Emily Weigandt, Fairlawn High School junior and Alyssa Anderson, Miami East High School senior as Students of the Quarter for the second nine-week grading period. These two individuals were selected from a group of eight students nominated by faculty for the quarter honors. Anderson is an Early Childhood Education and Care student who is described by her instructors as always having a smile on her face, has a great work ethic, and an example for all other students to follow. She is the daughter of Eric and Shantel Anderson. Weigandt is a student in the Interactive Media lab. Her academic and lab instructors tell how Emily is a conscientious student with a tremendous work ethic. Just a junior, she has already passed her Adobe certifications and has maintained an A average in all of her classes. She is the daughter of Chris and Yolanda Weigandt. Nominations for Student of the Quarter are made by career-technical program instructors. Students’ attendance, citizenship, leadership, and effort are taken into account. In addition, the student’s academic instructors are asked to rate each nominee’s effort during the nine-week grading period. 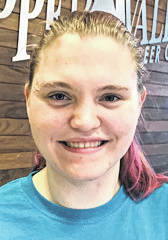 Students earning an “Award of Merit” designation for Student of the Quarter honors are level one students Andrea Ford, Early Childhood Education and Care from Fairlawn High School, Courtney Hoehne, Discovery from Anna High School, and Nick Mowry, Auto Technologies from Bradford High School. Level two students recognized for “Award of Merit” are Maelee Enochs, Cosmetology from Jackson Center High School, Hannah Bixler, Teacher Academy from Houston High School, and Lexi Hayslip, Interactive Media from Troy High School.